Fruit grapes has many health benefits because it contains antioxidants and high fiber so it can be a source of energy is refreshing and nutritious prevent premature aging. In addition, this fruit contains vitamin C, A, B (thiamin), E, and K (potassium). Vitamin C, in addition to healthier gums and mouth (anti-thrush), also contains aktioksidan that can maintain the body's antioxidants. Besides the meat, grape seed is actually no less nutritious because it contains pycnogenol, boosters of collagen to the blood vessel flexibility. While his skin is rich in flavonoids that function antioxidant substances. 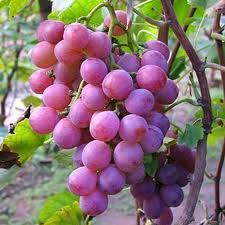 Another benefit of eating grapes is to prevent colon cancer because the content of antioxidants and fiber. The number of properties of grapes have been viewed as a business opportunity by various beverage producers in the packaging so that we can now consume grape juice whenever we want.